It's been awhile since I've done an EOTD, because I've just been too lazy to do up my eyes. 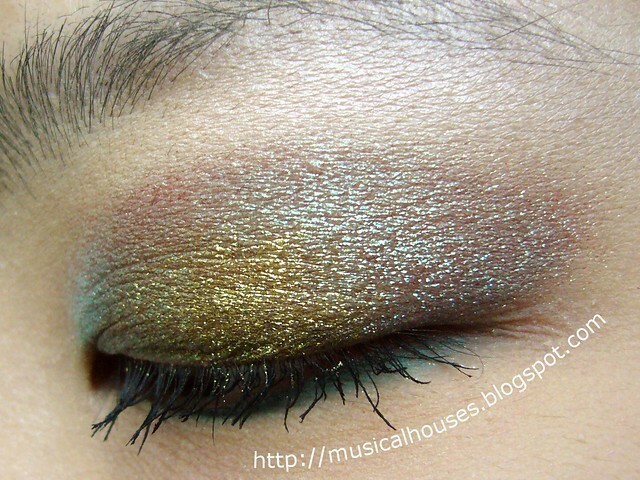 But then, the MUFE Holodiam Powders landed, and I felt inspired all over again! I'm not usually that great at applying eyeshadow (especially loose powder), but with the Holodiam powders, it was surprisingly hassle-free! Just look at the eye look I did with these powders! I've swatched the MUFE Holodiam Powders before, and back then, I said these were fantastic due to their colour changing ability. Now that I've been playing around with these, they look absolutely gorgeous with a base. 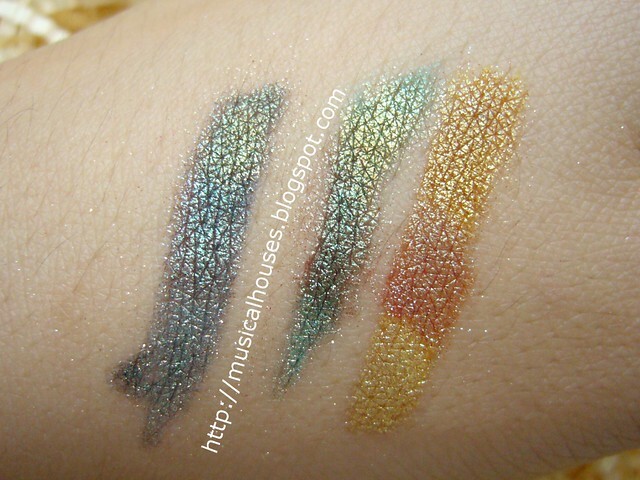 My swatches back then were dry and over bare skin, so they were kinda crappy and not really representative of the product when used, so I've just done some really casual swatches with these over various eyeliners (which were makeshift bases) - a blue (MUFE 3L), a green (Sleek Toxic) and a yellow (Sleek Canary). I love how just having a base really changes the colour shift and how the powders just pop and look so multi-dimensional! In my previous post on the MUFE Holodiam Powders there was a demo with these over a black base - but they look good over a base of any colour. But anyway, back to my eye look. For this, I was kinda lazy to do a proper prepping and all that, so I just winged it. I used Sleek Toxic, a green eyeliner, as a base, and applied it over my eyelid so that the colours would "pop", and also as a sticky base for the powders to hold on to. The MUFE powders were then applied on top: I used 304 (brown gold with yellow, green and blue highlights) on the lid, 302 (plum with turquoise, violet and pink highlights) on the contour/crease area, and just a little touch of 303 (white with gold, green and blue highlights) in the inner corner for that flash of colour. Despite my worries about fallout from the loose powders, I found that they held quite well once a base was used. Also, a patting rather than swiping motion helped when applying the eyeshadows. I really loved how this eye look turned out. You can't really see it in the photos, as they didn't really capture the opalescence, but when I turned my head from side to side, the colour shift was amazing - the three colours just flashed different shades that changed with the angle, and it looked really cool. I think, out of all the EOTDs I've done so far, this is by far the coolest, as you just have to love that duochrome-y effect! Best part is that it was actually quite easy - apply a cream base, pat the powders on top, blend slightly, and voila! an eye look that looks harder to apply than it really is. You can use multiple colours to up the glamour, or else perhaps just a dab of one shade (I recommend 303 or 304) in the center of the eyelid for a little pop of colour, if you're looking to go more neutral. Wow I am in love with those colours! The Holodiam powders are available in stores already? This is so beautiful especially the Sleek Canary, such a pretty pretty yellow. I agree it is an awesome eotd. Oh wow, I can't believe how amazing these shadows are! And I love how you wore them! 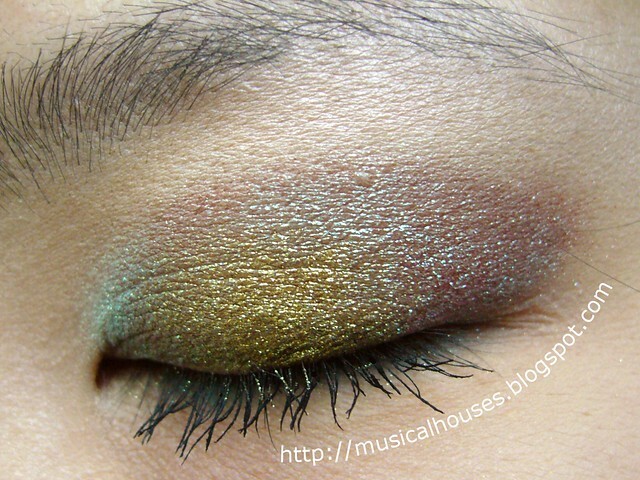 Such a pretty eye look, Love hoe you create the color and the gradation. Wow that looks amazing! Do they sell these everywhere, or just in Asia?